Oh I Love your honesty..!!! Great finds today you lucky thing! The new header is really gorgeous! 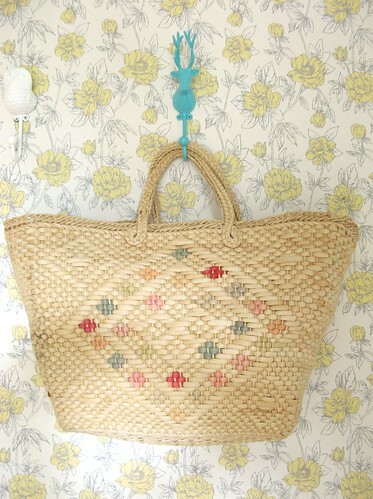 Oh the straw bag! If I weren't already sitting, I would plop right down on this chair, hand to my chest. I'm going right now to empty my change jar and be off on a hunt to find one like it. Well, maybe Saturday, but I'm going. I am so happy to have discovered your delightfully pleasing blog! I love your ways with "things" and words. Little monkey with a broken nose is charming to the utmost! The pictures illustrating it are perfectly perfect! So happy you found him and gave him such a sweet new nose. Have a beautiful day! wonderful treasures you found and all at a bargain price :) so fun to come here. Your thrift shops look a lot better than the ones I have to choose from! Love the new banner, very nice missus. yes her twiddling has made her blog look much richer! 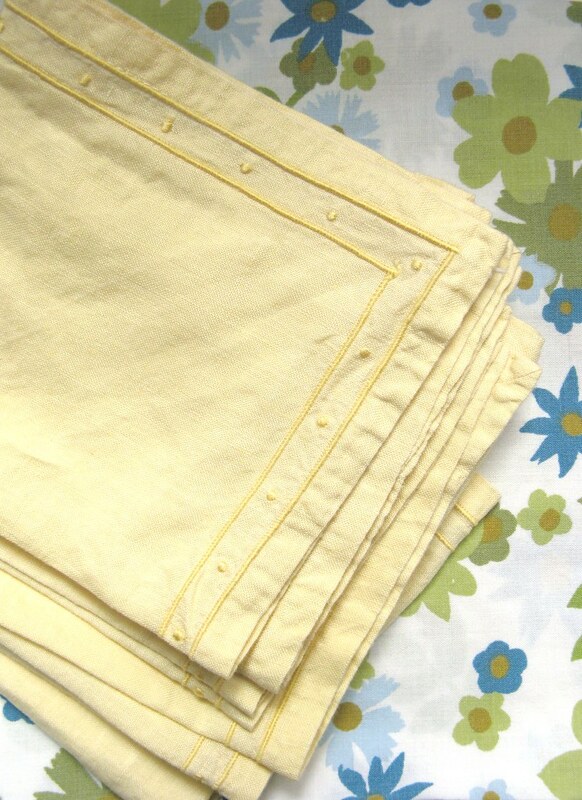 Now is that vintagey basket lined yet....with vintagey scrummy summery fabric? What a satisfying thrift stop! Great finds, I especially like the monkey and of course his new nose! I love the fiddling..I jolly well wish I had thrift sop on the island where I could buy half of what you gathered..lucky lucky you!! (greeks don't 'get' thrift shops.. 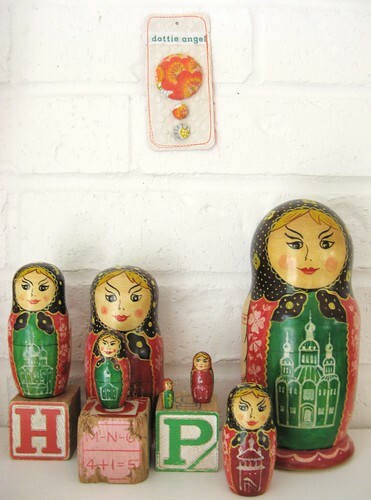 Your Russian dolls do look rather troubled don't they? What truly delicious thrifty finds, I must be thrifting in the wrong places. yum yum yum. Great finds. Also, I very much admire your new banner. Lovely indeed. Love your thrifty thursday! May have to join in with my own too. Trouble I have is finding somewhere for all my lovely finds to live, there's just not enough space in my little house. 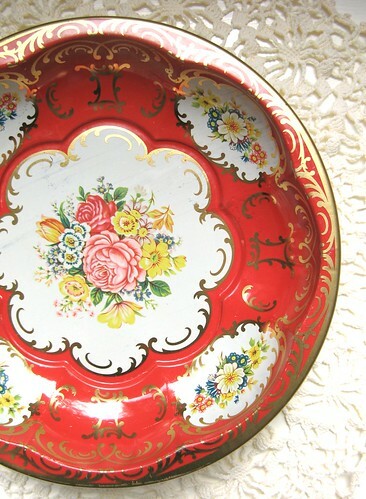 BTW did you know Jill at lunevintage.blogspot.com does thrifty thursday too? ohhh, nice haul!! love the monkey. Oh you can never deny the urge to thrift! 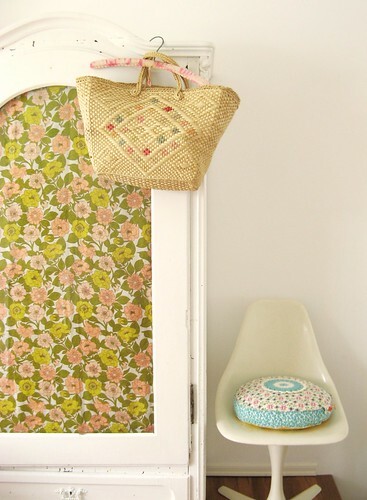 It's like food for the soul & the air you breathe...I love your sweet finds, especially the straw bag. And, I had noticed you've been a little bit busy freshening up your lovely blog, looks great! Well, well, well. We have TWO sets of "salty" and "peppy." My daughter just gift thrifted me THE SAME TRAY! all that for $15? nice work! i really love the straw bag -- so perfect for summer! Beautiful finds. 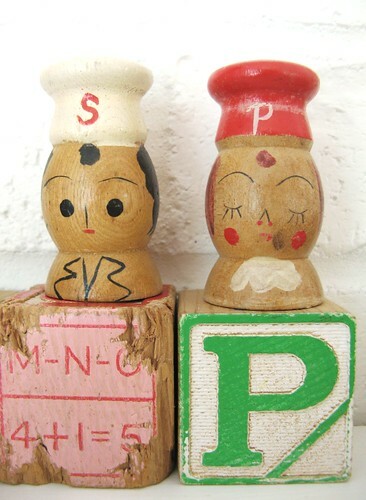 Those salt and petter shakers are divine. Precious finds... I adore your salt and pepper shakers. and i thank you kindly for it! What great finds. I too like the cross Russian dolls! It's a good thing hunting treasures. I've eight little S & P people who gaze at us from the top of a doorway. They're happy I think unlike your concerned Russian ladies. Love your red cardi outfit. Love your thrifty finds and your new banner! Adorable new banner, and as always love the thrifty finds. 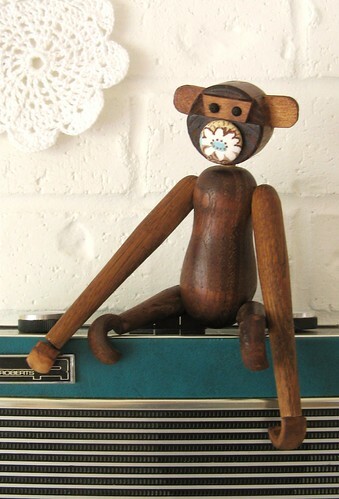 I am so pleased that little wooden monkey has the power of smell again, and as a bonus it will always be sweet. oh to be you !!! what a lovely life you lead ! so creative and beautiful. I too would love to rob Anthropologie..although i would need a huge moving van. I love love love your clothes and wish i could sew. great finds. My mother had my kids this week and I snuck out to some antique/thrift stores. I understand the "thrill" of it! What pretty things! I always like looking at other people's finds, but I'm also glad I didn't go to a thrift store and end up buying lots of "maybe I can do this ..." buys! I am jealous of the bag, it's just what I'm looking for, to carry my summer things about. I love the new banner, too. I will be recommending some good bloggy reads on my blog soon, and yours will definitely be one of them. Beautiful! I love that wall paper! There is something deeply satisfying about re-homing such gems - it makes you wonder why someone, somewhere fell out of love with them. Although I think I can understand in the case of the Russian dolls - I'm not sure I could stand up to the scrutiny of their disapproving looks! I LOVE your Thrifty Thursdays! I am drooling over those nesting dolls! Those are the angriest nesting dolls ever! Having grown up with nesting dolls in the homes of the Russian part of my family, I'm sad to say I only encountered happy ones until now. They're awesome.